Recently, Kathy and I made our way to our favorite spots in Grand Teton National Park finding great scenics, bears, river otters, osprey, coyote, bison, pronghorn, and elk. But we both knew the trip wouldn’t be successful until we spent a fair amount of time with our favorite, the largest of the deer family, Alces alces, the North American Moose. I don’t know about you, but I am fascinated with moose. Many think they are strange looking and ungainly, me, I think they are too cool. Naturally, when you see an animal in a certain place you go back to the same spot year after year. It’s like fishing. You always fish the same hole you caught the ‘big one’ in. 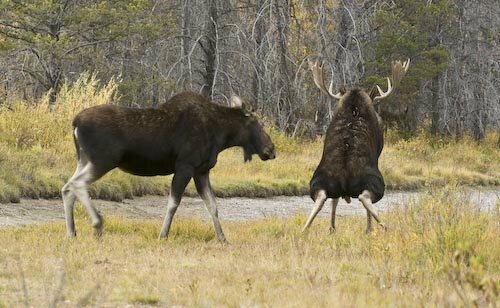 While some animals may just be passing through, moose seem to always hang out in the same habitat at the same time of year. Off we went to some of the best and most dependable moose habitat in the Rockies. 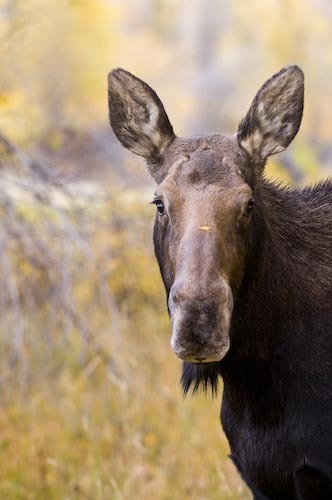 While hiking the game trails that meander through aspens and willows we discussed how sometimes you can be just a few yards from a resting moose and not know it. After a couple of tries we found our friends. A large bull moose and 5 cows. The rut was in full swing and at times the action was intense. At one point the bull was trying to get the cows attention. It would thrash the willows with its huge antlers. No response. Then it made a wallow by scraping the ground bare with its hooves then urinating to make a mud puddle then laying in it. This got the cows attention and three of them came running. The bull got up and one cow would rub herself against him while another chased off the third and sat in the wallow herself. This went on for a few moments until one cow meandered off with the bull in hot pursuit, while the other cow sat in the wallow for about 30 minutes. As dusk fell quietly and quickly, the moose moved to a more secluded place, we cautiously followed keeping a distance that would not intrude on our subjects. Our persistence paid off. Just before dark the moose mounted the cow. We left fully satisfied as the last time we witnessed this was in Alaska many years ago. The next day we returned to spend more time with the group. 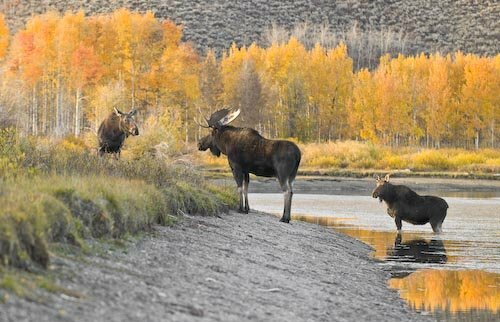 As we waited and watched we found ourselves surrounded by all six moose as they rested or munched on the willows. We found ourselves completely surrounded by the Rhythm of Moose. with the szme topics? Many thanks! and techniques for success in Ad – Words advertising.